For years, users have wondered why on earth Microsoft wouldn’t make the taskbar customizable and usable across multiple monitors. The release of Windows 8 won’t tell us why it took so long, but at least we’ll get some new features. Here’s a quick look for those that haven’t already seen them. The new Taskbar in Windows 8 finally spans multiple monitors, and can be customized so that the taskbar buttons on each monitor are the buttons for windows open on that monitor. You can also make both taskbars show all windows if you choose. 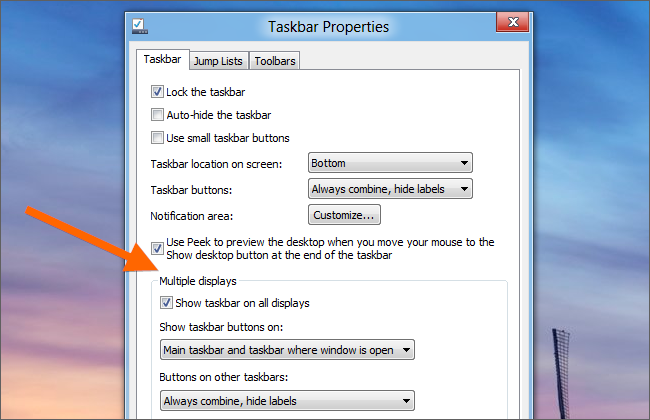 To access the new settings, head into Taskbar Properties by right-clicking on the Taskbar and choosing Properties. Once there, you’ll see the “Multiple displays” section at the bottom of the dialog, where you can quickly check the box to enable or disable showing the taskbar across displays. Want to make bigger taskbar buttons on the second monitor? You can also change the “Buttons on other taskbars” setting. It’s all very simple, and you’ve probably already come across this if you’ve spent more than a few minutes in Windows 8… but for those that haven’t, it’s great to know that Windows 8 finally gives us a multi-monitor taskbar.